Zeisel, Hans. Papers, [Box 3, Folder 8] and [Box 119, Folder 7] Special Collections Research Center, University of Chicago Library. Materials used with the permission of the Special Collections Research Center, University of Chicago Library. 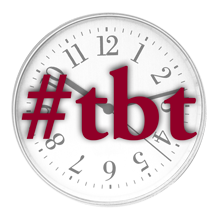 Throwback Thursday is an occasional feature offering glimpses into the Law School’s rich history. In early 1950, not long after taking his daughter Jean to see Katharine Hepburn play the heroine Rosalind in Shakespeare’s As You Like It on Broadway, future Law School Professor Hans Zeisel wrote the actress a letter offering notes on her interpretation of a line in a scene with the character Sylvius. Thus began a decades-long correspondence marked by Zeisel’s cordial commentary on Hepburn’s work, her gracious appreciation for his notes and gifts of lavender fragrance, and occasional intellectual musings. The letters, about a dozen of which are part of the newly processed Hans Zeisel Papers, available at the Regenstein Library’s Special Collections Research Center, document a pre-digital connection between Law School intellect and Hollywood celebrity that was fueled, at least in the beginning, by a shared fondness for the Bard. The entire collection—91.5 linear feet of material that became available in September—includes 173 boxes of Zeisel’s writing, research, correspondence, and more. 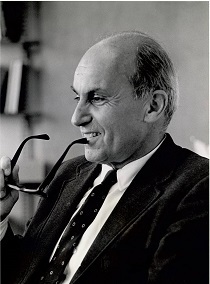 Zeisel, a sociologist and lawyer who was an authority on juries, capital punishment, and market survey techniques, joined the Law School faculty in 1953 to collaborate with Professor Harry Kalven, Jr. on a study of the American jury system funded by the Ford Foundation. Zeisel retired in 1974 but maintained an office at the Law School and continued to write, consult, and do research. He fervently opposed the death penalty; his letters with Hepburn, in fact, appear to have fizzled in 1989 over differing views on capital punishment before resuming in 1992, the year he died. Exchanged between 1950 and 1992, the letters, only some of which are preserved in the collection, maintain an air of formality; although it appears the two may have met in person, the relationship was one of pen pals. Many of his notes are typed on Law School letterhead, and many of hers are written on personal stationary emblazoned in red with her full name, Katharine Houghton Hepburn. The topics range from small talk to deeper social commentary. 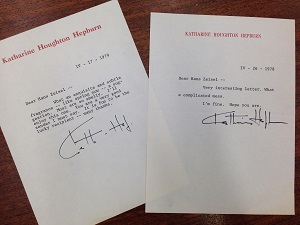 The following month, he sent a short note, as well as a copy of his 1983 book, The Limits of Law Enforcement, which argued that society should rely less on law enforcement to reduce crime and focus more on educating and guiding young children. I am worried about your well being. I am sending you my new book; it is a new look at an old problem. You might care to browse through the first 88 pages, if you have nothing better to do. My well being is fine—just a really badly smashed ankle—But almost mended—and it works. Thanks for the book and the bittersweet. Before he became a lawyer or a sociologist, Zeisel, who was born in Czechoslovakia but grew up in Austria, wanted to be an actor. As a teen in Vienna, he and his friends worked as claqueurs—professional applauders. Their job was to sit in the audience and, when the tenor started to sing his aria, begin the applause. “I don’t think he got paid, but that’s how he got in to see all the operas for free,” Richards said. He also loved Shakespeare, and his daughter said that one of his proudest papers wasn’t legal scholarship but an analysis of Romeo’s motives. 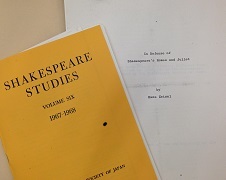 That essay, “In Defense of Shakespeare’s Romeo and Juliet,” was published in the 1967-68 volume of Shakespeare Studies, a journal by the Shakespeare Society of Japan. His correspondence with Hepburn grew from this love; his admiration for her came later. Very interesting letter. What a complicated mess. I’m fine. Hope you are. In 1979, Zeisel sent her a bottle of lavender water—a gift he appears to have sent again several years later after she ran out. What an exquisite and subtle fragrance – like spring now – a suggestion. Most are so smelly. I’ll enjoy this one. You are a very good sender I must say. It is fun to be the lucky recipient – many thanks. 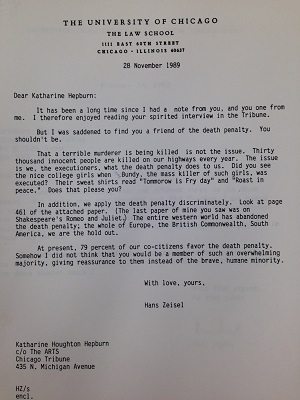 The correspondence, however, faltered in 1989, when Hepburn expressed support for capital punishment. Still, a little more than two years later, Zeisel resumed contact after seeing an interview she had done with Phil Donahue. We stopped corresponding over our different views on the death penalty. But having seen your interview with Phil Donahue, I am moved to write you a letter with two-fold congratulations: First, to your triumph over Parkinson’s disease and secondly, for your put-down of that oaf by courageously sticking to your atheist position. Not many public figures would dare do this. One more question. (I will not reveal the answer to anyone.) Did you really not know your interviewer’s name, or did you just superbly put him down another notch? Less than a month later, Zeisel died. But these snippets of his correspondence with Hepburn highlight two of his life’s greatest passions: his opposition to capital punishment, and Shakespeare.